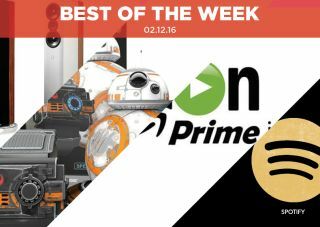 Best of the Week: Monitor Audio buys Roksan, Q Acoustics speakers, Christmas Gift Guide and more | What Hi-Fi? A round-up of all the main highlights, including Monitor Audio buying Roksan, Q Acoustics' new high-end Concept 500 speakers, Virgin 4K TV and a review of Amazon Prime Video. This week Q Acoustics stepped away from the affordable end of the market with the launch of its Concept 500 speakers, Netflix added offline viewing to its Android and iOS apps and Monitor Audio announced the acquisition of fellow British hi-fi company, Roksan. And we had reviews of Amazon's updated Prime Video streaming service, the Pathos In The Groove phono amp and Burmester's 099/956 Mk2 pre/power combo, amongst others. Q Acoustics is wading into the high-end speaker market with the Concept 500. The new speakers sport two new mid/bass drivers, cabinets designed to improve the speaker's sound, and a look that remains distinctively Q Acoustics. The Concept 500 speakers are priced at £3600 per pair and are due to go on sale in February 2017. Netflix has added offline functionality to its iOS and Android apps. That means you can download films and TV programmes and watch them later - though it comes with a caveat. Like Amazon Prime, not all titles are available to download. So you can watch the Netflix Original Series on the go but you're less likely to be able to watch Marvel's Avengers Assemble. Monitor Audio announced this week that it would be buying Roksan. Chiefly known for its CD players, stereo amps and turntables, Roksan's current staff will join Monitor Audio, but Roksan will continue to trade under its own brand name. Hopefully this union of two well-known names in British hi-fi will result in even better products. "Amazon Prime Instant Video has undoubtedly matured as a video streaming service"
Amazon's video offering initially stumbled out of the gate, confusing its users with labyrinthine interfaces and a content offering that was lacking in comparison to its main rival, Netflix. No more. Prime Video has upped its game offering plenty of titles in both HD and 4K and often getting newer releases ahead of Netflix. Interface niggles still arise and device support is not as wide as Netflix, but there's no doubt its now an excellent streaming video service. "There’s plenty of punch, plus the ability to track tricky rhythm tracks with determination"
To make a great phono stage, it needs to fulfil a number of things. Low levels of noise, easy cartridge-matching and great sound – the Pathos does that in some style. The sound is a refined, insightful and ultimately entertaining one that sounds well and truly like its from the Pathos family. So long as you have a very talented (and expensive) turntable, you'll be able to get a lot out of this phono amp. "We’ve come to expect certain things from Burmester products. The 099/956 Mk2 pre/power combination conforms to type"
Burmester never do things on the cheap, but then if it's this good, why complain? The company's latest high-end pre/power amp offers a smooth, insightful, agile sound, with impressive dynamics. Others may have the last word in resolution and transparency, but if you want to make the most of your music collection (and have a wedge of cash), the 099/956 combo deserves to be heard.